Tenants Harbor, one of the villages that makes up the town of St. George, grew up around a sheltered harbor on the east side of the St. George peninsula, at the southwest end of Penobscot Bay. With fishing and granite quarrying flourishing in the area, Congress appropriated $4,500 for a lighthouse on 22-acre Southern Island, at the enttrance to the harbor, in August 1854. The 27-foot-tall round brick tower, attached to a wood-frame dwelling, originally held a revolving fourth-order Fresnel lens exhibiting a red flash visible for 13 nautical miles. The light was 66 feet above mean high water. The characteristic was later changed to a fixed red light varied by a brighter flash every 60 seconds, and records indicate a fifth-order lens was in use by 1900. The dwelling was originally painted brown and the tower was painted white, and the roof of the lantern and the ventilator ball were painted red. The tower is connected to the wooden keeper's dwelling by a small workroom. Later additions to the station included a boathouse in 1880, a storage shed in 1895, and an oil house in 1906. A small shed was built next to the kitchen wing of the dwelling in 1887. For some years, the light station had a hand-operated fog bell. A wooden pyramidal bell tower with automatic striking machinery was later added. The first keeper was Levi Smalley of St. George. John A. Farnham, who had worked as a blacksmith in St. George, succeeded Smalley in 1867. Five years later, Farnham was accused of being "negligent in his duties" by lighthouse inspector W. K. Mayo. Farnham was subsequently dismissed. 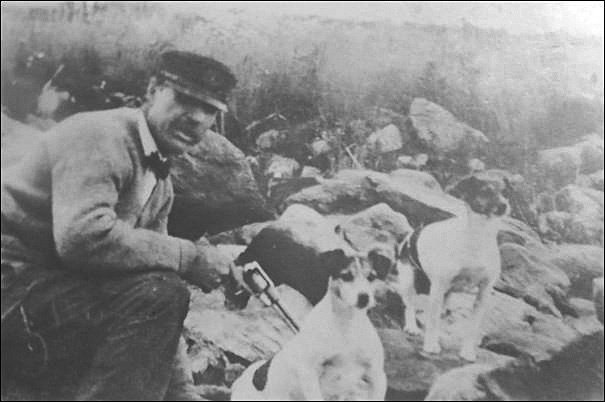 Thaddeus A. Wallace, a native of Rockport, Maine, who had been an assistant at Matinicus Rock Light Station, became keeper in 1892. Wallace died in September 1898, and his wife, Ellen (Tolman), served as keeper until a permanent replacement arrived. Joseph N. Jellison, the next keeper, stayed for 22 years. Jellison had served as an assistant keeper at Whitehead Light, where his older brother, Frank N. Jellison, was the principal keeper. The keeper from 1920 to 1923 was Willie Corbett, who went to an 18-year stay at Little River Light. Leonard Bosworth Dudley was keeper from 1923 to 1933. His daughter, June Dudley Watts, told Cheryl Shelton-Roberts, author of the book Lighthouse Families, that boats were sometimes stranded near Southern Island. Her father once pulled a boat off a bar with a rope during a storm; on other occasions he took his boat to the mainland to get help from the Coast Guard. June often helped her father by cleaning the glass in the lighthouse tower, and she learned to tend the light. She also helped care for the station's cow and chickens. She was taken by boat to the mainland to attend school, and sometimes she went alone to do shopping. When she was 19 years old, June met a local lobsterman named Everett Watts, and the two were soon married. They spent their honeymoon in Boston. In 1934, Tenants Harbor Light was one of a group of Maine lighthouses discontinued by the government and sold at auction. The lighthouse was bought by a Rockland resident. The island passed through several hands until artist Andrew Wyeth and his wife, Betsy James Wyeth, bought it in 1978. The Wyeths spent a number of summers on Southern Island. Betsy Wyeth told Architectural Digest in 1986, "I love everything about this house. Just walking into it refreshes me. It's like being on a ship-the brass polished, everything swept clean. I love the patterns of our life here." Andrew Wyeth, a history buff, designed a studio inside the base of the old 30-foot-tall bell tower. The room is a scaled-down version of Lord Nelson's quarters on the Victory. Since 1990, Betsy and Andrew's son, artist Jamie Wyeth, and his wife, Phyllis Mills Wyeth, have lived on the island. "It's like living in an Andrew Wyeth painting," Jamie Wyeth told National Geographic. In March 1993, Jamie Wyeth weathered a blizzard on Southern Island. He spent much of the storm in the lighthouse. "It was fantastic," he said. "It really blew a gale. There are vents in the lighthouse tower, and when the wind came screaming through it sounded like fifty metroliners." Keeper Joseph Jellison in the U.S. Lighthouse Service dory used for transportation to the mainland. (The identity of the woman is unknown.) Courtesy of Paulette Nolan. Above and right, Keeper Joseph Jellison. 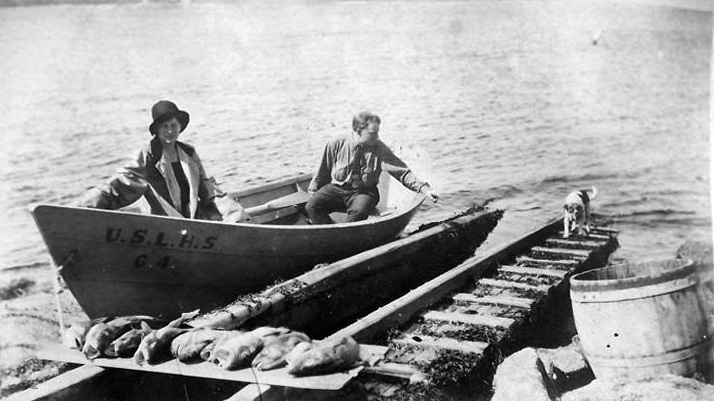 The dogs and gun helped keep the island rat-free. Both photos courtesy of Paulette Nolan. Tenants Harbor Light has appeared in a number of paintings by Andrew and Jamie Wyeth, including Andrew Wyeth's "Signal Flags" and "Iris at Sea," painted by Jamie Wyeth to raise funds for the Island Institute of Rockland. Left: Jamie Wyeth firing a cannon to greet a passing boat, August 2015.